. Published on March 3, 2013 . Meditation has the power to change lives but many people say it’s too hard to do. We think the habit is just as easy to pick up as any other daily habit, maybe even easier. The first few days of building a habit are hard–our minds and bodies naturally revolt against change–but there comes a time when you adapt to the new behavior and momentum starts to move you forward instead of push you backward. When does this happen in Meditation? Well, we’re not going to make any wild claims about how long it takes to form the habit but we do know that it gets easier to meditate after the 11th day of daily meditation. 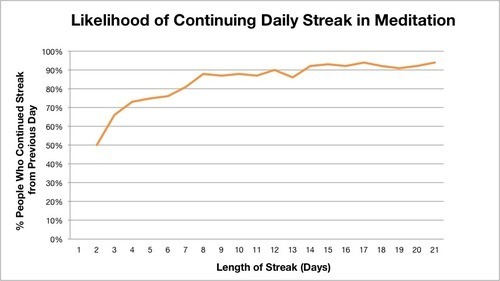 To find this out, we graphed the likelihood that someone would continue their daily streak over time. In the Meditate habit, 90% of people with an 11 day streak went on to have a 12 day streak. The odds remained in their favor after that date. How does Meditation compare to habits listed in our Easiest Habits category (which we selected because they had the most 21+ day streaks)? It’s almost as easy to get into the habit of daily meditation as it is to floss. You’re as likely to keep meditating as you are to take your vitamins daily. People find it harder to drink more water and eat breakfast every day than they do to meditate. 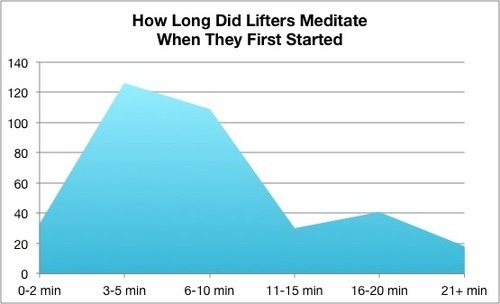 Half of people who meditate on Lift do it at least once a day. We found this out by surveying Lifters in the Meditate habit. We also asked for their advice for newbies.The most popular tip they gave was to practice daily and not to judge a session by its quality or length. Meditation seems to defy the Deliberate Practice rule we love at Lift: that you get more out of consistency if you have strong fundamentals. We’re sure that fundamentals help but frequency trumps all in meditation. I find it helpful to have more frequent, rather than longer, sittings. Missing a day is much worse than having an ineffective day. Even if your meditation does not go well it’s still worth doing. Athletes don’t set a personal best each time they train. Another common tip was to start small. It’s okay to just count a few breaths or meditate for a minute or less. Most people meditated between 3-5 minutes per session when they first began the habit. Don’t feel like you need to work up to a crazy session length, either. Lifters meditate an average of 16.8 minutes per session. 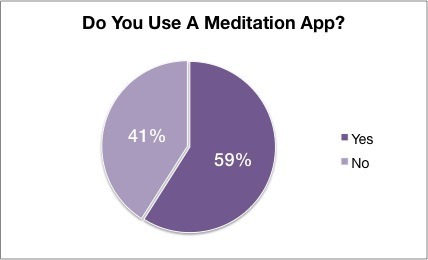 59% of people who meditate on Lift enlist the help of an app. In fact, app use correlated to more frequent meditation. 62% of people who meditated more than 3 days a week used an app compared to 50% of people who meditated 3 days a week or less. Don’t want to download another app? Many Lifters just use Apple’s iOS timer. Also consider reading a book on meditation, listening to an audio recording, attending a class, center or retreat or finding a buddy or mentor to practice with you; all of these strategies were highly recommended by Lifters in the Meditate habit. We’ll post additional tips on Twitter over the next month and feel free to share your own by tweeting with the hashtag #MarchMeditation. Oh, and don’t forget to sign up for the March Meditation Challenge. 1. In the survey we asked people if they used an app to help them meditate and some folks answered “Lift.” We should have clarified that we meant apps in addition to Lift.